While Firefox doesn't natively support Chromecast on desktop, there's a new third party tool called fx_cast, that adds Chromecast support to Firefox, on Windows, macOS and Linux. fx_cast is currently "very work in progress". Its developers say it's currently incomplete and likely buggy. fx_cast is made of two parts: a Firefox extension and a companion application that needs to run in the background. To work around Google's proprietary protocol, fx_cast needs a companion Node.js bridge application that needs to be installed on the computer, which then connects with the receiver devices. Right now there are bridge companion app binaries for Linux (RPM and DEB) and macOS only. While Windows is supported, there are no Windows binaries for now because the fx_cast developer doesn't use Windows. fx_cast allows casting web apps like Netflix or BBC iPlayer, and non-DRM HTML5 media in general, with no guarantees it will work with anything else right now. 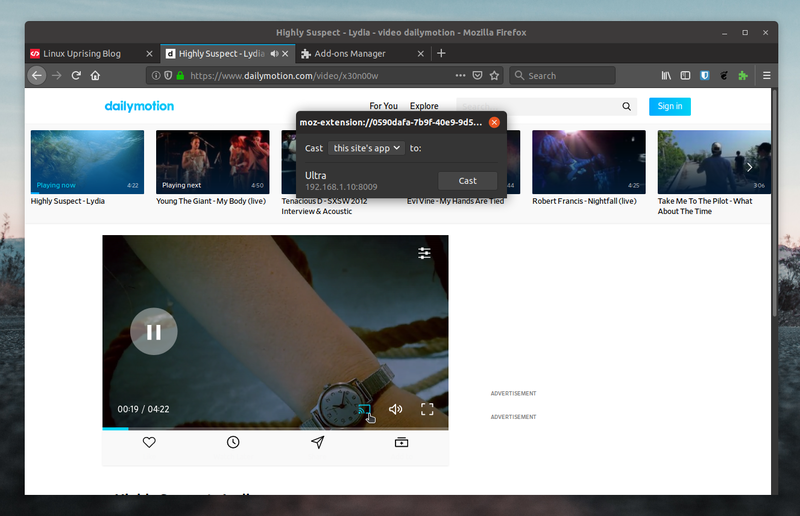 I tried it with Twitch and DailyMotion - my Chromecast showed up immediately for DailyMotion, and I was able to cast from Firefox without any issues, while for Twitch I had to reload the page a few times to get the cast button to appear. Controlling the video worked too, allowing play/pause or changing the volume with the two websites I tried it (Twitch and DailyMotion). There's one major website that doesn't work with fx_cast right now though: YouTube. There's some explanation as to why that's the case, on Reddit. The fx_cast project page doesn't mention what exactly doesn't work right now. I can tell you what I noticed while using it, albeit for a short time. There doesn't seem to be a way to stop a website from casting by clicking the cast button - once you've started casting, clicking the cast button does nothing, so to stop casting you'll have to... cast something else. You can also pause the video. On Linux, to avoid having to launch the fx_cast bridge when you want to cast to a Chromecast from Firefox, you can add /opt/fx_cast/bridge to your startup applications. After installing the extension, the bridge, and running the bridge app, right click the fx_cast extension in the Firefox toolbar and select Manage Extension. Most websites won't load the cast API unless the browser presents itself as Chrome, so you won't see a cast button. For such websites, you'll need to whitelist the domain in the extension options page. 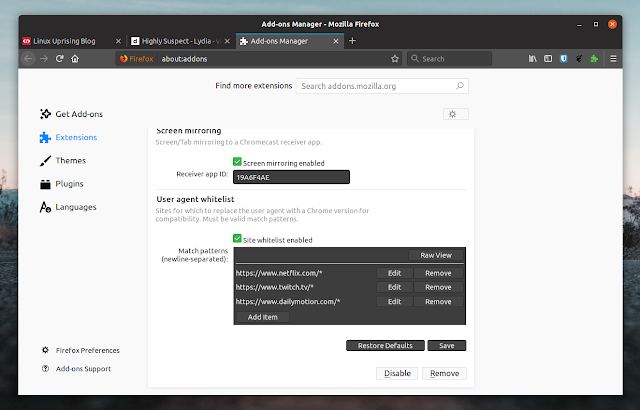 In the fx_cast extension options, scroll down to the Site whitelist enabled option (and make sure it's checked), then add the websites you want to be able to cast to your Chromecast from Firefox, under Match patterns. Add them in the same way Netflix is added (Netflix is there by default), for example https://www.dailymotion.com/* for Dailymotion. Remember to click the Save button after making changes to the fx_cast extension preferences. You can also add <all_urls> to whitelist all websites, but this may cause breakage on some websites! 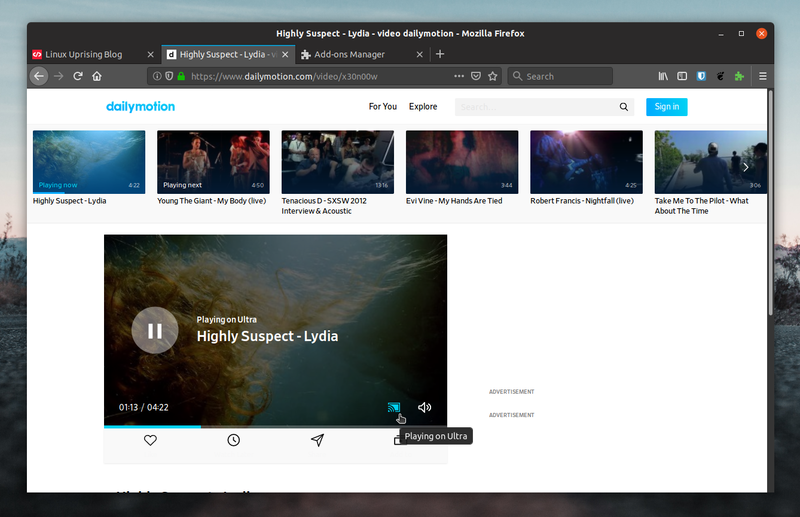 Now you can visit a cast-enabled website (that was previously whitelisted), like Netflix, DailyMotion, and so on, and you should see a cast button that allows you to stream the video to a Chromecast, just like in Chrome. Unless there's a bug in fx_cast. In case of remote HTML5 media that's not DRM protected, right click the video and it should have a Cast... context menu item that you can use to cast the video to a Chromecast device. Don't try to use the fx_cast Firefox toolbar button to cast. The popup that shows up after clicking the extension button doesn't do anything for now.